If there’s love on the outside, inside it there’s always hatred, and vice-versa. In spirituality, one never exists without the other. This gives rise to perfection. By exerting to ask for the friends, we’ll be liberated from egoism’s prison, our spirit will rise from the hole of egoism, we’ll be able to bestow to the friends, care for them instead of ourselves and thus with our screen we’ll enter the upper world, the quality of bestowal and love. In an integral system, no single element can fulfill itself, even if such a possibility existed. The Creator confuses us and creates problems between us so we’ll need Him in order to sort things out between us, in our lives, and…to turn to Him so He’ll establish connections between us—which means He will reveal the world’s entire state to us. When the upper force that governs a person manifests, and one sees how this upper force governs everything, nothing new happens. Only an understanding emerges of the Creator and answers: why the world exists, the role of everyone and each one. But this is my birth in the new world! Everything exists and operates only in order to ultimately reveal the Creator. There are no other actions in nature. We carry this out involuntarily, governed by Nature. The aim of our development lies in independently figuring out how to do this consciously. A great force is needed to handle the ego and pull me out of the ego-prison, like a magnet to which a piece of metal is stuck. I want to tear the metal away from the magnet, but I can’t do that to myself. But if I ask the group, it’ll grab on and pull me away from egoism to itself! How do we enter the upper world, the quality of bestowal, to see the world undistorted by our egoism? Kabbalists advise: place yourself under the group’s influence so it’ll pull you out of the ego-prison since you can’t pull yourself out of it. Give the group a chance to do this. On 10/23/18 the international forum “Democracy Promotion and America’s Global Leadership” was held. Conclusion: promoting democracy was a mistake. My conclusion: you can’t correct society without correcting man. It must start with re-educating man. That’s what Kabbalah says. Everything in nature follows the principle of combination of opposites, except man, who can’t stand this. Our bodies, the still, vegetative and animate nature, have 2 opposite forces operating in everything—in mutual opposition and harmony. That’s how we should work in spirituality! In our world we feel unidirectional acts: hate or love, separated from each other. This sets our world apart from the spiritual one—in spirituality one doesn’t exist without the other: if love is outside, there’s hate inside it, and vice versa. This produces perfection! By coming closer to each other, we awaken the force of rejection. One can’t be without the other. No spiritual act can be one-sided. It always contains opposites. Spirituality is perfect—in it opposites act as one whole. To acquire the quality of bestowal and see the world undistorted by ego, I must enter the group, place myself under its influence, so it’ll pull me away from ego like a piece of metal from a magnet. I can’t pull myself out of egoistic prison—only the force of the group can! The forces by which we’ll come out of ourselves are the forces of our soul. It’s possible to rise above restriction of egoism’s power and enter the upper world, the quality of bestowal, only when the body remains in the ego-prison while the spirit exits it. If you think only of the friends and not yourself, you’ll have their and the Creator’s support. That’s how I pull myself by the hair out of the egoistic hole! By thinking about how to save the friends from ego with prayer, I won’t think about myself but about how to save them and pull them out. This will be my salvation, rising above myself to their cares, being under their influence through prayer for them. But every element of the system can be fulfilled if the surrounding elements fulfill it! Love is complete, mutual connection between creatures. I feel the other’s desires and can fulfill them. I know how to fulfill the other. No one is able to fulfill himself, one is powerless to be fulfilled. His officials were raised by financiers—he needs to get rid of them! The #USA has set out on a new route! All USA presidents were backed by transnational financiers: each one brought a new budget, but not a new policy. #Trump is taking the USA out of the rule of financiers-liberals-WTO-globalization and making the dollar the national currency. That’s what nature has planned. Look closely and you’ll see! There’s no answer to the question about life’s meaning. So we run away from the question. Why suffer pointlessly? We can tear away from the current of life with the group’s help. It lifts us above egoism. Seeing above ego, thinking of the group, you’ll see the true world. Kabbalah is in demand. The mind understands that it’s right, but our egoistic essence rejects it. Our task is thus to adapt Kabbalah in the world to correct ego-desires into one desire for connection. This is done by the upper force at our request. It’s our task to appeal to it. “Are you sick and tired of the Jews destroying your country through mass immigration and degeneracy? 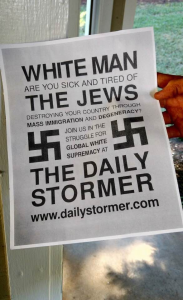 Join us in the struggle for global white supremacy.” These were the first words on a flyer that was placed this week in mailboxes in Cary, North Carolina. The posters on campus at least blamed Jews for something specific. They accused them of trying to thwart the appointment of Supreme Court Justice, Brett Kavanaugh. However, you’ll find a different reason in every flyer: Jews are guilty of mass immigration, destroying the economy, corrupting the government or what have you. Throughout history, Jews have been persecuted and accused of almost anything. Kabbalist Yehuda Ashlag writes about this phenomenon: “The fact is that Jews are hated in all nations, whether it is due to religion, race, capitalism, communism, cosmopolitanism etc., the hatred precedes all of the reasons.” Why is that? Because the Jewish people have an obligation to fulfill towards the world. And as long as we ignore it, we will be hated and persecuted. Unfortunately, most Jews are not aware of their unique function in the evolution of society. As Kabbalah explains, the Jewish people act as a central “hub” within the network of humanity. This is why they were integrated with the world throughout history. When Jews from all walks of life engage in unity above all differences, they enable positive connection across the whole of humanity. On the other hand, when they succumb to conflict and separation, they hold humanity back from its next level of development. Subconsciously, anti-Semites recognize the unique function of Jews within the human network. However, like little children, they find it difficult to explain their feelings and formulate their demands. Thus, they push, harass and even attack, as they try to call for attention to their distress. We call it anti-Semitism, but in fact, they seek pain relief. What we see and feel in our world are only consequences that come from a deeper layer of nature. 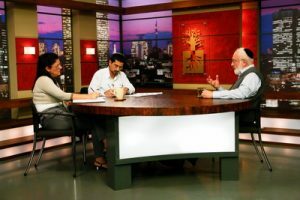 Kabbalah uncovers the natural laws that shape the evolution of human society and how they manifest in the relationship between the Jews and the rest of the world. We can use the power of our minds to heal ourselves and the world. We are living in a tightly connected battlefield, bombarded by subconscious, evil thoughts and painful conflict between neighbors. We affect one another, either positively or negatively within this integral system whether we like it or not. We can, nevertheless, create goodness by installing a mental antivirus or a positive attitude toward others so that we treat them in the same manner we would treat our beloved children. By acting artificially in this way as though we were playing a game, we work against shame and resistance and reveal love between us.